In the newsletter of February 20, 2000 I discussed the future of Microsoft in particular with respect to the possibility of a breakup. The conclusion then was that a breakup of the company was unlikely and that even if it were to happen, the company still had a considerable amount of growth to accomplish. Exhibit 3 below reproduces the evolution of the company's revenue as it was then analyzed updated with data points for the last six quarters (white circles). In retrospect we can say that Microsoft grew at a somewhat lower-than-expected rate but almost compatible with what had been forecasted (i.e., it is within the 90% confidence-level range). Exhibit 3. This graph originally published in the newsletter issue of 20-Feb-2000 is updated here with data points for the last six quarters (white circles). The seasons are redefined in terms of the lower dotted line that corresponds to the 90% confidence level. Microsoft seems to have entered its "summer" season, meaning that its rate of growth will not grow further but will begin declining around 2004-2005. However, this analysis is rather crude because it checks the company's growth only in terms of one variable, its revenue. We can try to confront this result by analyzing Microsoft's stock price as a species (à la DJIA above). Exhibit 4. The evolution of the share volume of Microsoft's stock and an S-curve fit. The data points are daily. This is the "true" volume, i.e., corrected for splits. The vertical units are in 100,000. Exhibit 5. The evolution of the dollar volume of Microsoft's stock and an S-curve fit. The data points are daily. The dollar volume is obtained as the average daily price times the share volume of the day. The vertical axis is in $1,000,000. Exhibit 6 shows the evolution of the stock's price in terms of both actual data and the above calculation that results into a forecast. The purple line is not a fit to the data and yet it describes well the stock's spectacular rise during the late 1990s and the subsequent decline. The forecast stabilizes around $62. Of course, the price is expected to fluctuate around this level significantly (the price is calculated as a ratio of two numbers that fluctuate themselves significantly). But Microsoft's stock will no longer reward its investors in a major way. On the other hand, most Dow stocks may do worse than Microsoft; see expected trend for the DJIA in Exhibit 1 (red line). Exhibit 6. 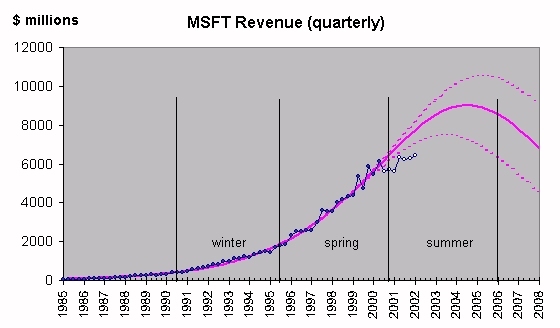 The evolution of Microsoft's stock price (blue line) and a calculation/forecast (purple line) according to the approach described in An S-Shaped trail to Wall Street. The vertical axis is in dollars. * The fact that upward excursions extend further than downward ones is well understood (see work by John Harte, professor of environmental science at the University of California at Berkeley.